Other posts on this project: Green and Gold Quilt Pt. 1, Green and Gold Quilt Pt. 2, Green and Gold Quilt Pt. 3. 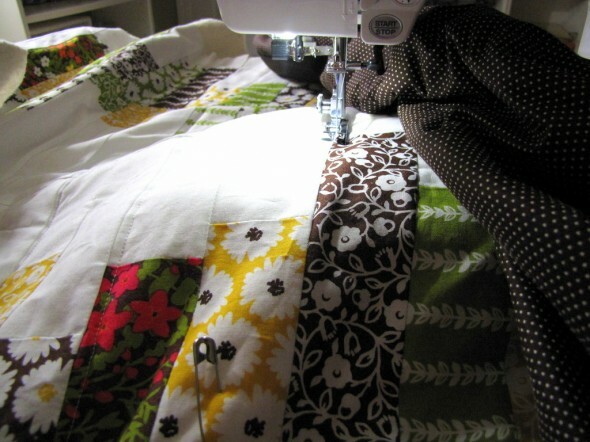 I took a hiatus from this quilt to get through the holiday season, but this weekend I’ve gotten back to it. I decided to use a simple brown microdot print for the backing of the quilt, and then I quilted it with horizontal lines last night. I also got it trimmed up and ready for binding. Now I just have to decide on a fabric for the binding. 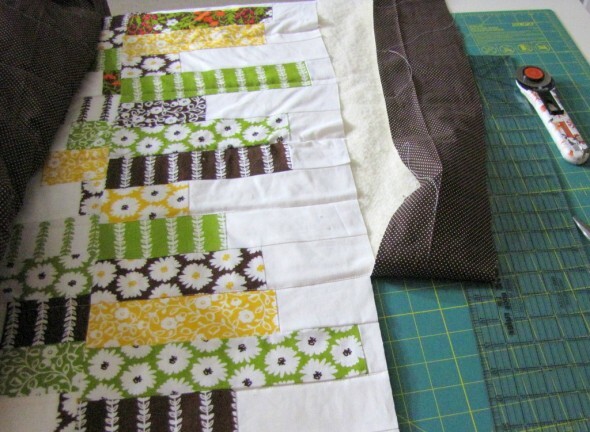 I’m tempted to use the leftover backing fabric, I’ve never done that with a quilt. But I like the idea of it a lot, the binding kind of disappearing into the backing. I don’t have enough of the Honeybee fabric that I used for the quilt top to make the binding, and I don’t know if I want to introduce another print that isn’t part of that collection. We’ll see.